Yesterday, as Betsy and I were sitting on the porch in the Terlingua Ghost town watching the sun set in the East, smoking a delicious Cohiba Maduro and sipping a locally brewed Porter, Sharron Reed introduced me to Trevor Smith, an alarmingly talented banjo player from Austin, and his wife Christina. Trevor plays with “Wood and Wire,” a well-known bluesgrass group that travels the country irritating traditionalists and delighting music lovers, I suspect. Family Crisis Center of the Big Bend, Inc.
Once again, the Terlingua community came together to take care of our own. Terlinguans, wherever you are, give yourselves a hand. I did a blog post HERE explaining why this is something we had to do right now. A few weeks ago, Mike Drinkard told me he could provide food assistance for the 600 or so people in the Terlingua area who needed it for $300, and he was having trouble coming up with the $300. Sunday night we raised about $2,000 for food distribution. More importantly, over 30 people signed pledge forms to contribute monthly. When you add in Lajitas Golf Resort for $250/month (thank you Ruffin Moore, GM) and the Terlingua Preservation Society for $420/month- they picked up Glenn Felt’s donation as a memorial to Glenn, that gives Mike over $1,000 a month in recurring income to buy food. On Saturday, 2/22/14, Terlingua said good-bye to Glenn Felts in a fashion he would have approved of. There was a wake/party at La Kiva with live music, beverages, and a delicious pot-luck dinner. Terlinguans from all over the country travelled to gather one last time. Friends who hadn’t seen each other in years hugged. There were tears, laughter, and dancing. Attendance was limited to close friends and family. Glenn was much loved and had a lot of friends. The parking lot was full. There were cars parked along the road. The club was packed. As the sun dropped low in the sky, shots of Glenn’s favorite drink – 12 year old Macallen single-malt scotch – were passed out to all attendees and we gathered for a final toast to Glenn. Sunday night, 2/16/14, there was a benefit concert at the Starlight Theatre to generate funds to send a girl from Boquillas off to school. The Terlingua community raised $1,075 for the scholarship fund. Since Cynta only needs $250 right now, TerlinguaCares has set up a fund for Cynta’s projects with the remainder of the money. The plan was for the “band of angels” to play an acoustic set early in the evening and rock out later on… and, once again, I discovered that making plans is for amateurs. We had so many musicians who wanted to contribute that it turned into a concert. Buckner ran sound and herded cats. The Starlight Theatre provided a comfy and friendly location for the benefit as well as paying the band – and the band donated that paycheck to the fund-raiser. We were hoping to raise $500, which will cover the tuition for a year. Terlingua reached deep and more than doubled that. I’m proud of my community – we funding compassion in action and having a party while we’re at it. It’s the Terlingua way. Buckner kept it sounding good all night. 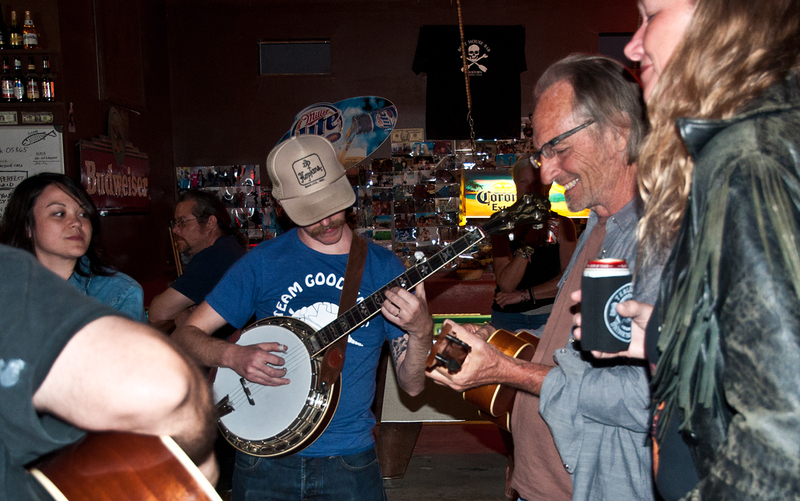 There was no stronger supporter of the Terlingua Music scene than Glenn Felts, the owner of La Kiva bar and restaurant. When Glenn died Monday night, it left a huge, Texan leprechaun-sized hole in our community. Glenn and his friendly grin had presided at La Kiva for years, overseeing some amazing parties, out-door concerts, and 17 years of Wednesday open mics. 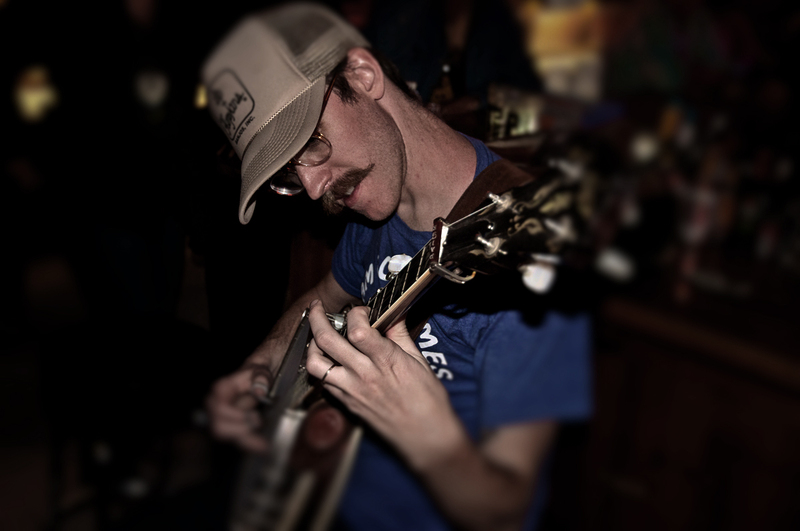 He could always be counted on to slip a musician a plate of his prize-winning BBQ or a beer. He loved music and musicians, and every player who had the privilege to play his stage knew it. On a personal note, last Wednesday’s open mic was pretty magical. Butch Hancock, Laird Considine, Charlotte Teer, Trevor Hickle and I played the first set to a full house. After our set, Glenn called me over. He had heard about my efforts to raise money for the local food bank. He offered to contribute $420 a month to buy groceries for the food bank to distribute. He had some great ideas, including opening up his restaurant once a month for a free meal for his hungry neighbors. Since the food bank only needs $400 a month to meet it’s minimum goals, Glenn basically offered to fund the food bank by himself. I couldn’t help myself- I gave him a big hug and teared up. Terlingua people are a proud bunch. The people who need the food bank are predominantly children and disabled adults. Glenn was not going to allow hungry children in his town. Tonight, the community gathered in the parking lot of La Kiva to honor and celebrate Glenn. 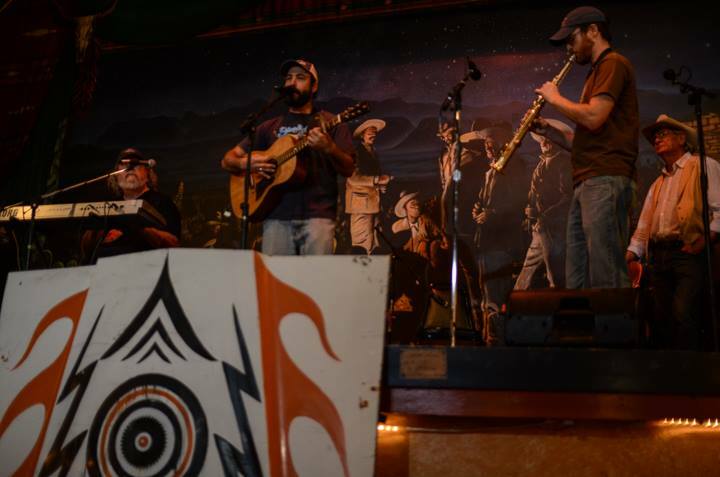 There had been music at La Kiva every Wednesday night for 17 years. Although the club was closed, musicians and friends braved the cold to sing, hug, cry, and tell stories about their time with Glenn outside the club. The Sheriff’s department had cordoned off the parking lot. The crowd gathered on the shoulder of the road across the street from La Kiva. A decision was made, and the gathering walked across the parking lot and gathered outside the club. It was cold and windy, but soon that chilly wind was carrying the sounds of guitars, mandolins, bass, saxophone, viola and voices that weren’t quite ready to say a final good-bye to 17 years of music on Wednesdays – or to Glenn. The Sheriff’s Department blocked the entrance to La Kiva.